Ending the tale of being rear-ended, I found another great lesson. Geico took care of my car, having ABRA Auto Body put on a brand-new bumper. 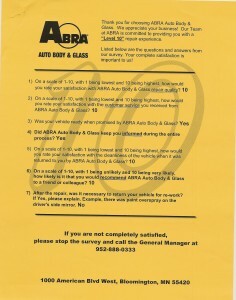 As I checked out, ABRA gave me a document to “help” me fill out my survey. Yes, they told me exactly how I should fill out my questions! Perhaps this shouldn’t surprise me. We’ve all heard of car salespeople, retail employees and restaurant staff who game the system. But to actually create a document telling me how to fill out the scores was a new one! Now combine gaming with survey fatigue. So many of us are becoming customer-obsessed, that we each send out more and more surveys. Each individual survey isn’t bad, but I can no longer go through a day without at least one survey request. Our local paper had a great column talking about the survey experience here. Maybe it’s time to start thinking about the post-survey world. What would you do if you could never use a 10-point scale again? 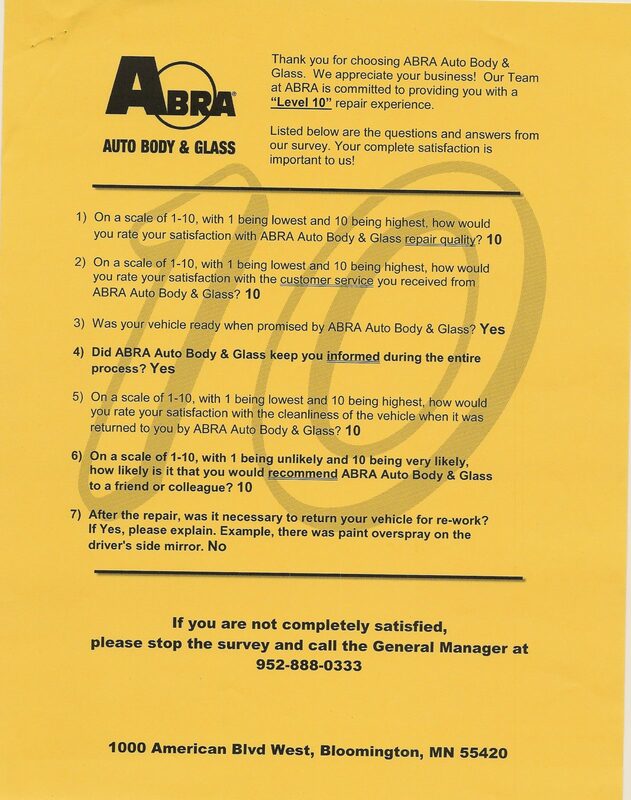 Surveys let us easily compare locations, times and types of customers. We can see how the Young and Healthy are doing in Cambridge versus Chicago, and see whether Beloit’s new staff is increasing engagement over time. But we also know that only a small segment of our customers are actually filling them out – and we hope against hope that those who fill it out are representative. As response levels drop, it’s time for a new plan. That’s why the future of surveys will be completely open-ended. Tell us about your experience. What went well, and what didn’t? Doing this will of course require text (or possibly speech) analytics to categorize the responses and provide actionable results. And it appears I’m not the only one thinking that way, with Qualtrics releasing a new VOC solution incorporating text analytics, and Wednesday’s announcement of the merger between Maritz and Allegiance that will also feature text analytics as just one piece of their offerings. I’m sure there there are countless others. That’s the future of surveys. Ignore NPS, Customer Effort, and all the rest. And just let our customers tell us what they’re thinking. We may not be there today – but it will happen.